If you are a Super Tuscan lover, you would no doubt have heard of Ornellaia. It is one of the early pioneers of Bolgheri, producing wines labeled then as IGT because of their use of Bordeaux grape varieties. Now Bolgheri is a DOC that is much admired and sought-after as an innovative region that is global in its outlook, unafraid to experiment and use non-native varieties. Ornellaia grew out of a response to Sassicaia, the first Super Tuscan red made up of mostly Cabernet Sauvignon with a touch of Cabernet Franc. Lodovico Antinori saw what his cousin was doing in Bolgheri at Sassicaia and started to experiment with the same grape varieties starting in the early 1980s. The result was the first vintage of Ornellaia released in 1985. 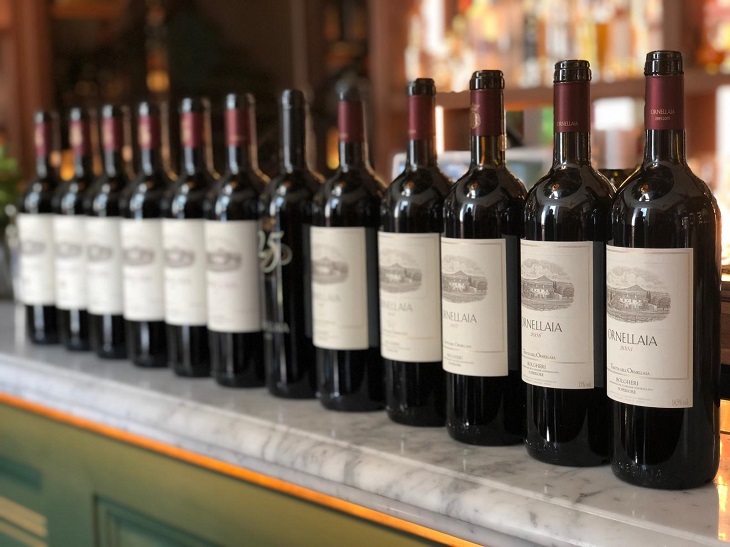 In April 2019 while I was in Tuscany, I had the wonderful opportunity to taste a vertical of Ornellaia going back to 2005 with head winemaker Axel Heinz. He arrived at the time that Frescobaldi took full ownership of the estate in 2005, which changed hands from Lodovico Antinori who brought in Robert Mondavi, which then passed over to Constellation. Under Axel’s direction, with the help of Michel Rolland who has been a consultant since the first vintage, the wines have been consistent, expressing their unique terroir as well as the vintage conditions. I admire the direction that the white Ornellaia white wines are taking – since 2013, the wines are gaining more depth and intensity. The 2016 is a wonderful Sauvignon Blanc-based white that has lovely minerality and precision. Axel decided to rejuvenate the white Ornellaia program in 2008 by replanting, adding some Vermentino and using some of the existing Sauvignon Blanc and Viognier grapes that were already planted. The white grapes are all planted on north-facing hillsides on limestone soil with higher elevation that offers cooler temperatures. Ornellaia red is distinctly Tuscan, with a slightly bigger body than Bordeaux and firmer, chewier tannins. The texture is more opulent and the fruit is ripe and sweet; in vintages like 2007 and 2010, these wines gather you in their warm embrace and seduce you with their charm and depth. Recent twin great vintages, 2015 and 2016, have the potential to become another 2007 and are wines to lay down in your cellar for decades. Below are my ratings from the vertical tasting of Ornellaia – full tasting notes can be found on my site.